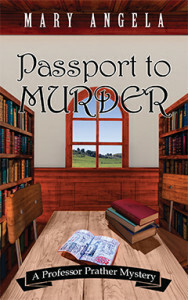 Passport to Murder ($15.95, 272 pages, ISBN: 978-1-60381-653-3) is the second cozy mystery by Mary Angela in a series featuring amateur sleuth and English professor Emmeline Prather. The murder of a professor cuts short a spring break getaway to Paris, and the remaining twelve travelers are all suspects, including Emmeline and her friend André. “Enjoyable [….] Emmeline’s shrewd questioning of students and professors uncovers hidden motives and secrets in this clever academic mystery.” Read more…. 4 Stars: “A murderer uses two distinct methods for murder in Angela’s second enthralling Emmeline Prather mystery. They are as unusual as they are different, which makes for intriguing reading. The world of academia is exciting in the way it is approached in this clandestine tale. Unique personalities abound and include more than one red herring.” Read more…. 5 Stars: “An engrossing story that will pull the reader in from the first page.” Read more…. “Em is a terrific character—outspoken, funny and fearless except in the affairs of the heart. I hope to read more of Mary Angela’s Professor Prather books.” Read more…. “The plotting is straightforward but has a nice (and believable) twist at the end, and the solution isn’t obvious, which makes it all a good puzzle. Overall, this is neither a character study nor a deeply plotted novel, but it is a fun, quick read filled with characters worth spending time with, just as a cozy should be, and both the setting and the relationships offer plenty of possibilities for future installments.” Read more…. “Seeing the human side of the professors and faculty was an entertaining element of the book. They all had unique personalities and it was fun to see them shine outside of the classroom setting. [….] I can’t wait to see where these characters go next!” Read more…. 4 Stars: “I enjoyed it. I liked the bookish heroine and her way of investigating that depends on her emotional intelligence.” Read more…. “I loved feeling the college experience again as we see Emmeline interacting with her English comp students and dealing with departmental and faculty politics. Her sleuthing is a delight. There are plenty of red herrings and clues for the armchair sleuth to consider along with Emmeline, and the grand unmasking of the killer hearkens beautifully to the familiar drawing-room exposes of classic mystery novels.” Read more…. “Passport to Murder is an intelligent contemporary cosy which isn’t overly saccharine and should appeal to fans of the genre who like an amateur detective who approaches mysteries through the power of the intellect rather than through non-stop action.” Read more…. Mary Angela teaches English for the University of South Dakota and enjoys reading, traveling, and spending time with her family. She lives in Sioux Falls, South Dakota, with her husband and two young daughters. An avid mystery fan, Mary is a member of Mystery Writers of America and Sisters in Crime. For more information, click here. I smoothed the page and recalled the day I had purchased the book at Copper Bluff’s bookstore. Ensconced between the bar and jewelers, the tiny shop specialized in collectable books but sold used and new copies as well as all genres. The owner was from California, an exotic location to us, and incredibly wealthy. She was a terrific purveyor of literature, and I spent many afternoons poring over first editions she kept locked in a small bookcase. She was a friend to readers and writers in the area, not to mention jobless eccentrics, and although she didn’t host many events (Café Joe had more room), she supported local artists by carrying their work. There was no better friend to the arts. Despite my book’s quick-moving plot, I was unable to concentrate on the words. I read and reread several pages, trying to immerse myself in the narrative. Yet all I could focus on were the bumps and drops of the plane and how the other passengers weathered them with such aplomb. It was as if they were not thirty thousand feet in the air but on a front porch swing. I looked around. Molly and Nick were having a lively conversation to my left that was growing more heated. That entire side of the plane, in fact, had been a lot more animated and drawn my attention several times. I soon realized I wasn’t the only one eavesdropping on Molly and Nick. The entire middle row was gawking in their direction as Molly’s gesticulations grew larger and more erratic. She seemed agitated, and now she tore at her seatbelt. She was shaking her head back and forth, tearing at her throat. He grabbed the backpack next to him, tugging at the zipper as it stuck halfway down. He retrieved what I assumed was an EpiPen, a little needle that looked like a child-size marker with a lid he had no trouble removing. The lid dropped to the floor as he stabbed the pen into her thigh with a force that made me jump. She slumped over, and he cried for help. Before the flight attendant could repeat the plea for a doctor, Dr. Judith Spade, our resident physician, was out of her seat examining Molly. The plane grew silent as we all watched in horror, waiting for Molly to regain consciousness. She never did. Judith shook her head. The pretty Molly Jaspers was dead.